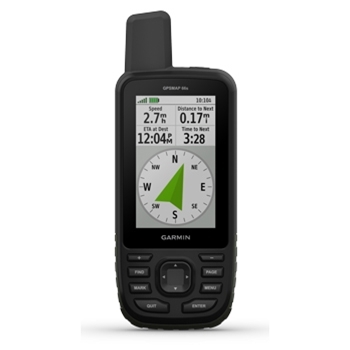 Garmin’s GPSMAP 66s with ABC Sensors (Altimeter, Barometer and Compass) is a rugged handheld GPS unit. BirdsEye Satellite Imagery with direct to device downloads, IPX7 Water Rating, Wireless connectivity and more! 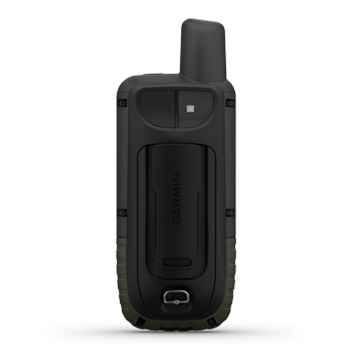 Garmin’s GPSMap 66s is one of the most versatile handheld GPS units on the market today! With Direct to device BirdsEye Satellite Imagery downloads you will receive a true representation of your surroundings in high res, and what’s even better is that there’s no annual subscription. Plus, with Garmin’s multisatellite feature you’ll have no issue locking onto satellites in harsh outdoor environments while keeping you on track! Built in A.B.C (Altimeter, Barometer and Compass) sensors that can be critical in a climb are included as well. The internal altimeter sensor provides precise elevation for ascent and descent, while the barometer offers the ability to predict weather changes in the short term by changes in air pressure. The 3-axis tilt compass provides heading while standing still which is good for getting bearing without having to be moving. Things can change extremely fast at higher altitudes so the built in sensors are a must! The bright sunlight readable 3” color 240x400 pixel TFT display, makes viewing clear and easy in any lighting situation, and the rugged Military grade housing is durable and shock resistant with a water rating of IPX7. A new design provides the familiar functionality of its predecessor with the same light weight of 8.1oz (including batteries). The built-in LED flashlight/SOS Beacon is a great backup if needed in an emergency for added piece of mind when you’re away from civilization. Every GPSMAP 66s includes a worldwide basemap but can also accept a MicroSD card for additional compatible Garmin Maps such as City Navigator, Topo, Huntview and more. The 66s can save up to 10,000 waypoints, and up to 250 routes with 16 GB of internal memory. 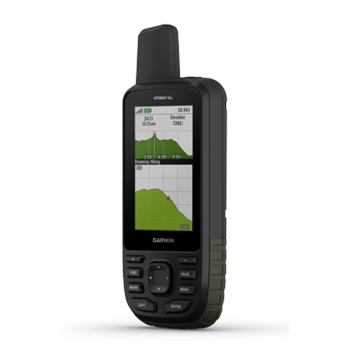 Wireless compatibility (Wi-Fi, Bluetooth and ANT+) enables you to simply pair your 66s with your smartphone with Garmin’s free Explore mobile app for data planning, such as syncing and reviewing your trips. Utilize Bluetooth connectivity for Garmin’s Active weather, and downloading from the Explore app, to tune into the latest weather updates and see actual weather in an animated radar picture right on the display. Geocaching Live is available through Garmin Connect- share clues and fun details about caches you find on a compatible smartphone, so family and friends can see and maybe be inspired to get outside and have fun with that too. If you are looking for a dependable multi-purpose GPS for the serious hiker, climber or the person that likes to go out and find caches this handheld can do it all. You can expect a 16 hour battery life on 2 double AA’s and up to one week battery life in Expedition mode. For added piece of mind in any outdoor adventure, don’t head out without a Garmin high sensitivity GPSMap 66s with BirdsEye by your side. Garmin’s GPSMAP 66s 24K Topo Bundle features the standard GPSMAP 66s package bundled with one Garmin Topo 24K US region on microSD/SD card.